The speed of the recent sell-off in stocks has caught many investors by surprise. It’s hard to know what causes stocks to rise and fall over short periods of time, but one factor at play may be that the Federal Reserve has been raising interest rates. Pundits have been discussing what raising rates means for stocks and your portfolio, but pundits are wrong as often as not. What does the data say? We looked back at the last 70 years of history and identified every month when interest rates were at all higher than they had been 12 months prior. The chart below shows the history of the Federal Funds rate in the US; the orange bars show each month that meets our criteria (interest rate at time > interest rate 12 month prior). We then studied what happened to the S&P 500 in each subsequent month. The chart below shows the average S&P 500 return for periods that met our criteria vs. periods that did not. 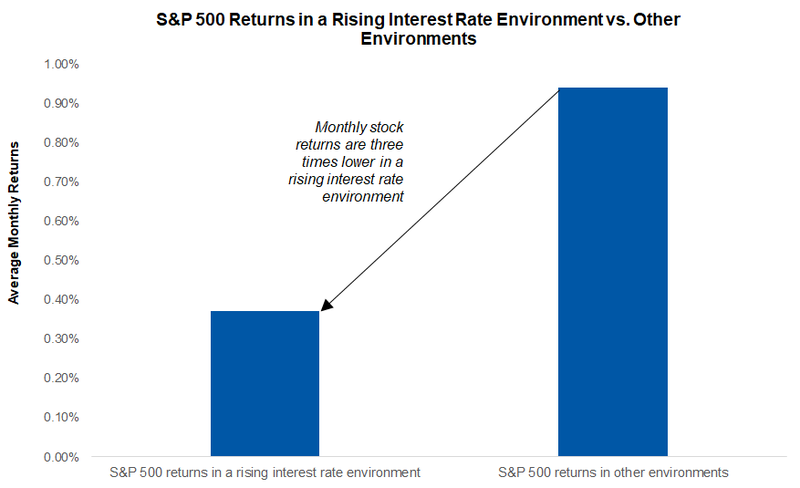 In short, stock gains tend to be 3 times lower during a rising rate environment compared to other environments, but are still positive. When we dig in deeper we see that while the market does tend to grow less in a rising rate environment on average, there is still historical precedent for it to go up a lot during these periods. 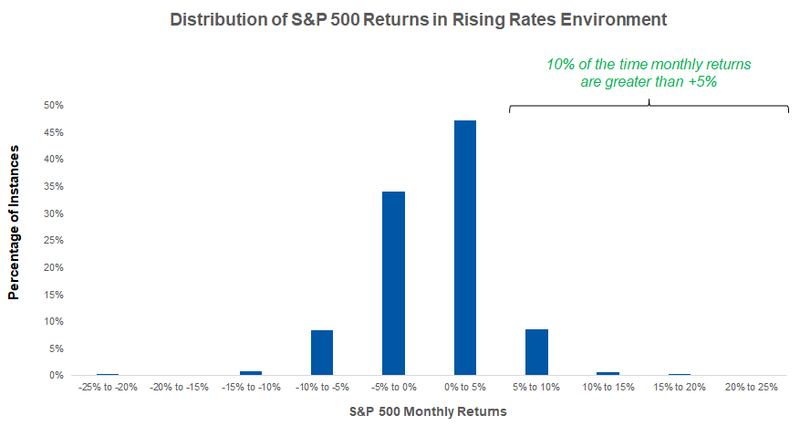 The chart below shows the how often different monthly returns occur during a rising rate environment. The chart shows that in 10% of historical cases, the market went up over 5% in a single month in the rising interest rate environment.